Deep Exploit is fully automated penetration tool linked with Metasploit. Deep Exploit has two exploitation modes. Deep Exploit identifies the status of all opened ports on the target server and executes the exploit at pinpoint based on past experience (trained result). Deep Exploit executes exploits using all combinations of “exploit module”, “target” and “payload” corresponding to a user’s indicated product name and port number. Deep Exploit’s key features are following. If “intelligence mode”, Deep Exploit can execute exploits at pinpoint (minimum 1 attempt). If “Brute force mode”, Deep Exploit can execute exploits thoroughly corresponding to user’s indicated product name and port number. If Deep Exploit succeeds the exploit to the target server, it further executes the exploit to other internal servers. Deep Exploit doesn’t need the “learning data”. Deep Exploit can learn how to method of exploitation by itself (uses reinforcement learning). 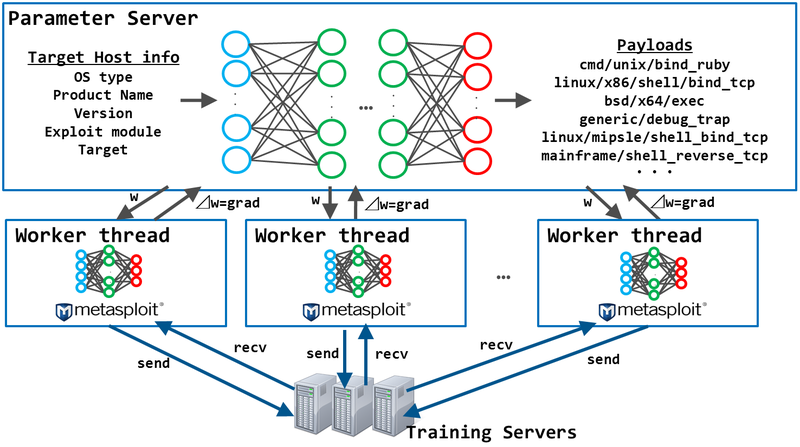 Deep Exploit uses distributed learning by multi-agents. So, we adopted an advanced machine learning model called A3C. Current Deep Exploit’s version is a beta. Step 1. Port scan the target server. Deep Exploit executes the port scanning using Nmap for gathering target server’s information. After, Deep Exploit executes two Metasploit’s command (hosts and services) via RPC API. ex) result of hosts command. Deep Exploit gets OS type from a result of hosts command. In above example, Deep Exploit gets OS type as Linux. ex) result of services command. Deep Exploit gets port numbers, protocol types, product name, product version from the result of port scanning. Step 2. Exploit using Metasploit for training. Deep Exploit learns how to method of exploitation using advanced machine learning model called A3C. So, Deep Exploit uses vulnerable servers such as metasploitable2, owaspbwa for learning. Step 3. Exploit using Metasploit for testing. Deep Exploit generates a report that summarizes vulnerabilities.